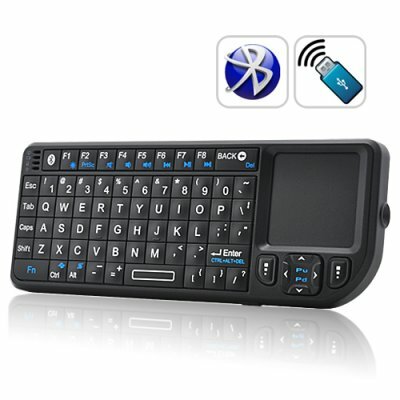 Successfully Added Mini Bluetooth Keyboard with Touchpad and Laser Pointer to your Shopping Cart. Full wireless control of your PC and smartphone is made easy with this new Mini Bluetooth Keyboard. With its portable size, a full QWERTY keyboard, touchpad, and even laser Pointer, this unique keyboard accessory is great for any occasion. This easy to use Mini Bluetooth Keyboard features a full QWERTY keyboard complete with function (Fn) key, F1 through F8 keys, space bar, number keys, Page UP/DOWN keys, left and right mouse keys and a responsive touchpad that works exactly like the one on your laptop. There are 72 keys in total - making this our most complete mini Bluetooth PC keyboard to date. What's more, the Mini Bluetooth Keyboard is small enough to easily fit in your jean pocket and powerful enough to use all day long. The Mini Bluetooth Keyboard uses advanced wireless Bluetooth technology, so it can be used in any location and without having to point it at your PC for it to work. Just plug the Bluetooth receiver into any USB port and you’re ready to go. When finished the USB receiver conveniently slides back into the keyboard until the next time you’re ready to use it. But best of all, this Mini Bluetooth Keyboard even works with your Nokia, Windows Mobile, and Google Android smartphones! Say hello to the best way to write emails, chat, and play games. Why spend $150 or more on a brand name mini Bluetooth keyboard when you can own one that’s the same quality, direct from the factory, and at a fraction of the cost? Take advantage of our unbeatable wholesale price and order the Mini Bluetooth Keyboard today while supplies last. And remember, all products from Chinavasion are in stock now and come with our hassle-free full 12 month warranty. Ideal for home entertainment use. Just connect your PC to your TV then use this remote to load movies, changes songs, browse the web and more- all from the comfort of your couch! How do I use this wireless keyboard with touch pad? Its easy, step one: Insert the USB dongle receiver into any available USB port on your computer or laptop. Step two: Turn ON the mini keyboard. Step three: Start enjoying full control of your PC!